More than just a travel guide, The Unofficial Girls Guide to New York delivers an in-depth look at Girls’ physical and cultural landscape. It’s the best way to visit Girls’ New York without paying for a plane ticket—or the perfect complement to your next trip. I hope I'm not too late with this post because THE UNOFFICIAL GIRLS GUIDE TO NEW YORK by Judy Gelman and Peter Zheutlin is a great gift idea for fans of HBO's television series Girls. I consider myself a pretty big fan of the show over the past two seasons (especially Season 1), and I'm anxiously awaiting its return in January. 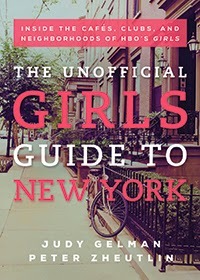 In the meantime, THE UNOFFICIAL GIRLS GUIDE TO NEW YORK has provided me with some fun entertainment. It is part travel guide because it features many of the familiar locations that Hannah and the girls visited in New York, but it's also a great way to reminisce about the show. Since I love visiting New York each year for BEA, THE UNOFFICIAL GIRLS GUIDE TO NEW YORK has given me a whole new world to explore in May! I have to admit that I was pleasantly surprised by this book. Not only does is explore many of the neighborhoods that appear in the show, but it also showcases many restaurants. For those of you are familiar with the series Girls, you know how much the setting plays a role in the stories. I appreciate that THE UNOFFICIAL GIRLS GUIDE TO NEW YORK provides even more details about these places and truly brings them to life for me. You might remember this author pairing because they wrote a book called THE UNOFFICIAL MAD MEN COOKBOOK: INSIDE THE KITCHENS, BARS, AND RESTAURANTS OF MAD MEN which I reviewed here. They are, first and foremost, cookbook authors so they managed to include lots of recipes in this book too. There is even the recipe for Serendipity's Frrrozen Hot Chocolate which some might say alone is worth the price of the book! Probably the most exciting thing to me (since I have little, if any, social life) is that one of the nightclubs I visited a few years ago appeared in the book. It's called The Greenhouse and was featured in Season 2 when Hannah visited it, high on cocaine! I didn't catch it when I saw the show, but I'm going to have to go back and watch it again! To learn more about the book, check out the official website here. Fans of Girls are going to love this book! Highly recommended! Boy, am I out of it! I've never even heard of that show, let alone seen it. It sounds like you found some new places for us to explore.